Wee Frolic : My Reflections on Grace Kelly: Forever the Actress. My Reflections on Grace Kelly: Forever the Actress. Last night I was watching To Catch a Thief for what may be the hundredth time, and I suppose that's how this piece began. Grace Kelly always escaped my radar as a favorite Golden Hollywood actress--to me, she was always too well-bred and calculated in the approach to her craft to really strike a nerve with me. In comparison to the audacity of Katharine Hepburn, the frank emotion of Greta Garbo, or the unapologetic sexuality of Jayne Mansfield, Grace always stood apart as a prim little square on the Hollywood playground and not much else. It always seemed that no matter how much reading on her I've done, or how many times I re-watched her films, she always swayed under a thin veil of illusion that I couldn't quite put a pin on. Yet, last night, I found myself viewing her banter with Cary Grant with slightly altered eyes...which leads me to the thoughts I've decided to put here. I feel that a great deal of people recognize Grace Kelly as a princess first, and as an actress (if at all) second. Therein lies the rub, and the nucleus of this piece. Grace was an impeccable actress. There is no masking that. I am compelled to believe that, despite the 'fairytale princess' image people always bestow on her, she was effectively robbed of the life she truly wanted and had worked very hard for. 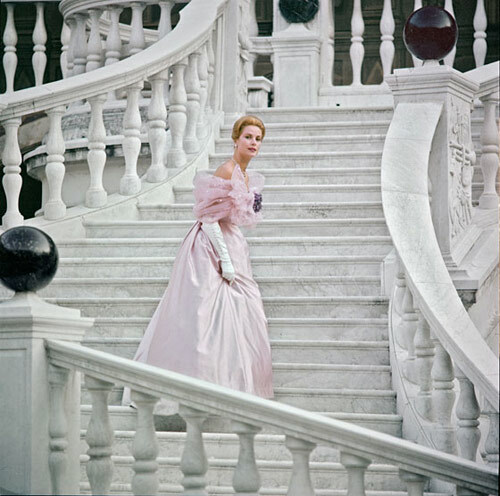 In 1956, Grace Kelly was at the top of her career. Only having begun starring in films six years before, she had become the muse of Alfred Hitchcock, won an Academy Award, and garnered unconditional praise of all of her elite co-stars. 1956 was also the year her career ended, with a very high-profile marriage to the monarch of a small European principality. If there was anything Grace Kelly was before she was 'Grace Kelly', it was well-bred. Her mother was a German-born professor of physical education at the University of Pennsylvania, and her father was an Olympian, and in later years, a politician. She had two older siblings, and one younger. Grace was not the favorite child. Her parents were stern, and structured. Her older siblings were competitive, and ambitious, and her younger sister was by all accounts severely coddled. She did average in school, and to some degree became interested in acting as early as twelve years old. Grace's parents were, at best, begrudgingly complacent about her decision to become an actress. What is known is after she was rejected from Bennington College due to low math scores, they agreed to fund her move to New York to study her craft. Her father, though particularly disgruntled with her choice of profession, used his influence to get her into the American Academy of Dramatic Arts. Upon arriving in New York, Grace threw herself headfirst into her study. She was told her accent wasn't quite seemly, so she tutored it in the transatlantic accent of Katharine Hepburn and Bette Davis. She studied scripts, and modeled in between classes and auditions. Grace's first screen test in 1950 was well-received. Director John Ford, in particular, took note of her quality of presence. Still, it wasn't until 1952 that she was given her first starring role alongside Clark Gable and Ava Gardner in Mogambo--and it was Ford who directed her into greatness. After Mogambo, which garnered Grace her first Academy Award nomination, she was suddenly a household name. Alfred Hitchcock, and his preference for blondes with pretty faces, came calling. Dial M for Murder was the first of three films she would make with Hitchcock, and he would prove to be one of her mentors in the industry. Their relationship, though good-natured and seemingly professional, was often framed with crassness on on the part of Hitchcock, who would in later years remark on her brisk departure from her career in saying, "Grace has found herself such a good part". In April of 1955, Grace had only one month before beat out Judy Garland's comeback performance as the winner of the Academy Award for Best Supporting Actress. It was a surprising victory for Grace, her winning role as the emotionally-torn, long-suffering Georgie Elgin was slated as an Academy favorite, but Garland had fought and campaigned hard for the win. The young blood had won in the end, and Garland was devastated. Grace's triumphant celebration was heralded by her invitation to head the U.S. delegation at the Cannes Film Festival. Grace, by way of her thorough education, was fluent in French and already dating the French actor Jean-Pierre Aumont. During her time at Cannes, she was invited to take part in a photo session at the Palace of Monaco. 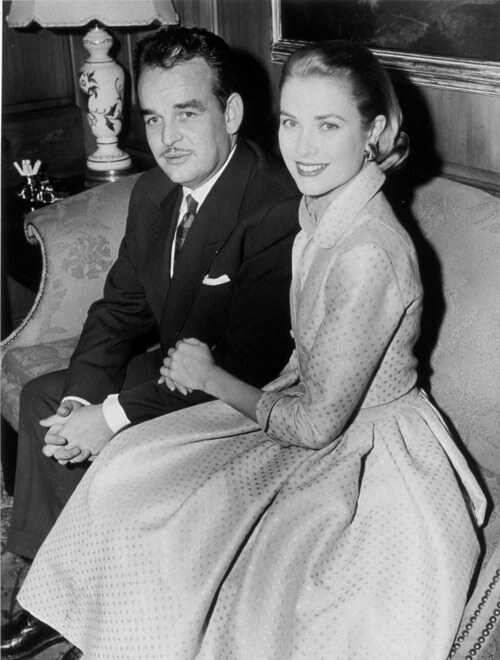 Rainier III of Monaco was under extreme pressure to find a bride, both from his advisers and his own family. European royals barred their daughters from being associated with the somewhat homely, quiet-natured prince. Scandal riddled his family, he himself had been involved with a French actress for ten years, and his country had been effectively bankrupt after World War II. Rainier III needed funds, and he needed an heir to brush off the ambitious desires his sister, Princess Antoinette, had of putting her own son on the throne. It would appear that Rainier's focus on Grace was almost immediate, and Grace--for her part--was an incredibly easy target. A wealthy American with a recognizable face, and a good reputation, seemed to be the answer to his prayers. Not only was she one of the most beautiful women in the world, she carried herself more as an aristocrat than an actress, with half of the pretense. It was almost impossible to stop the snowball effect of the affections of a prince once his attentions became somewhat public knowledge, and his attentions were almost immediate. In December of 1955, a mere nine months after making his acquaintance at Cannes, Rainier flew to the United States on an 'official tour'. He moseyed around for little while, met with the president and attended events, before he simply happened to be designated to stay with Grace and her parents at their family home. Three days after staying with the Kellys, Rainier officially proposed to Grace. It is no coincidence that, in order for the wedding to go forward, the Kellys had to provide a dowry of two million dollars. Two million dollars in 1955 translates to over sixteen million dollars today. Upon signing the papers, Rainier effectively gained Grace Kelly as his bride, and a purse of sixteen million dollars with her. I will end the historical context here, and spare the maddening details of the wedding--because truly, they were maddening. I would like to focus now on the very un-romantic details of this transaction, and it certainly was just that, a transaction. I obviously never knew Grace as a person, so I cannot know what she herself thought about this time in her life and the phenomenal changes that came with it. What I do know of the circumstances is she, in her own right, was a woman of great skill and acumen. She had earned a living for herself, and a reputation in Hollywood for being a great and talent actress. I do not know if she would agree with me, but again I must reiterate: I am compelled to believe that, despite the 'fairytale princess' image people always bestow on her, she was effectively robbed of the life she truly wanted and had worked very hard for. Her meeting with Rainier predates the feminist movement. He would have been a very impressive person to her family, and friends. The United States has always had a fascination with European Royalty (albeit, even when the said royal is poor). Rainier would have left an impression with his visit. His proposal would have come as a great honor to her, and to everyone associated with her. It was an opportunity to win her parent's approval--after all, she hadn't gained that in her career. How much higher could she possibly go in the eyes of everyone around her in that time period? Yet, even as I try to convince myself that there is a great possibility she was satisfied with the order of things...there is a part of me that feels strongly about the swift dismissal of her career at its peak, and the subsequent life that followed. One of the main points of my study is her continued friendship with Alfred Hitchcock, and his desire for her to play the lead role in Marnie. Hitchcock contacted Grace around 1962, and told her he wanted her specifically for the part. It was six or so years after her marriage, and she was now a mother and settled into her role as Princess of Monaco--but it would seem she was flattered and receptive of the offer. Hitchcock went so far as to send her the script, and she went so far as to read it and begin preparations to accept the role. Marnie and Grace, however, were not to be. Tippi Hedren, Grace's replacement in Hitchcock's affections, was given the part. Speculation surrounding the reason why Grace dismissed the role, after showing such an initial interest, pointed blame at Rainier and the rest of the royal family. Whatever the case, Grace would not appear onscreen again--save a brief thirty-three minute independent film she appeared in with Rainier in 1979.
Who would she have become were she not detoured away from the path she wanted in life? 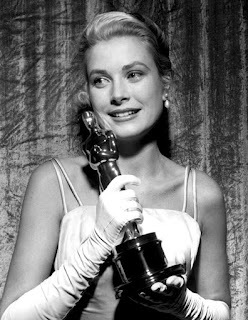 How many more Academy Awards would Grace Kelly have won in her life, were she not replaced by Grace, Princess of Monaco? Was this the path she truly wanted, or was she simply fulfilling the wishes of everyone surrounding her at the time? It's strange how my thoughts about Grace and her life all stemmed from re-watching a movie I have seen so many times before, and recognizing the glorious and unusual talent behind her eyes. It awoke a sadness for her inside of me, a sadness of years of that continued talent unrecognized and replaced by a different life altogether. We'll never know what Grace herself truly wanted, she never publicly spoke on the matter. Her impression upon Hollywood, and those of her peers, remained timeless. Cary Grant, in later years, when asked to name his favorite actress said, "Well, with all due respect to dear Ingrid Bergman, I much preferred Grace. She had serenity." And upon her sudden and tragic death in 1982, her once-costar James Stewart spoke fondly at her memorial service in Beverly Hills, "You know, I just love Grace Kelly...Grace brought into my life, as she brought into yours, a soft, warm light every time I saw her, and every time I saw her was a holiday of its own". I will remember her forever the actress, Grace Kelly.